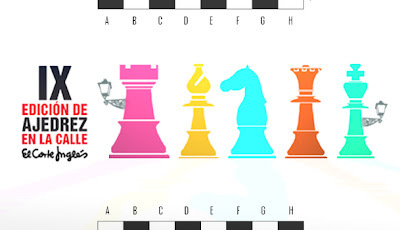 Wouldn't it be great if life really did imitate chess? Well perhaps not all of chess, just bits of it. 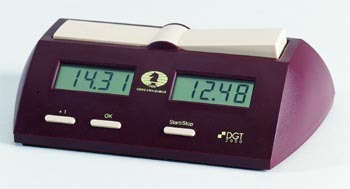 What about an incremental time control for instance? 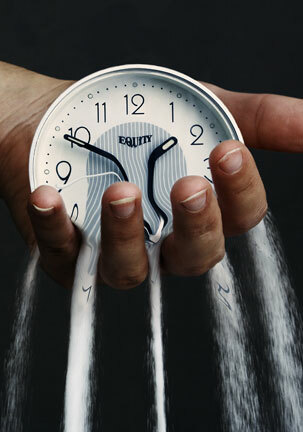 Every time you did something time would whizz backwards a bit and the day would suddenly be thirty seconds longer. Imagine how much easier it would be to get everything done. Actually, the more I think about it the more I can’t help but feel that God missed a trick at the Earth League AGM (circa 4004 BC) when he went for ‘Game in three-score-and-ten’ instead. Anyhoo, this flight of whimsy I bring to you as an explanation of why I haven't yet finished the review of the first Killer Endgames DVD. With Benasque approaching, and still a lot of fiddling around to do to make sure I actually get there, I'm afraid I'm struggling with a bit of real-life zeitnot. There will be a review, oh yes indeedy, it's just that it's going to happen bit by bit. Today's section will give an overview of the contents of the first DVD and then take a look at how it covers king and pawn endgames. Other subjects, including pretty much everything to do with the second disc, we'll save for another day. With a total playing time of four and a half hours to fill, Killer Endgames part I divides itself into four main sections. 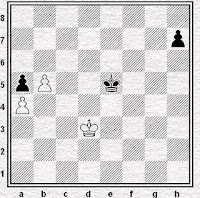 The first three teach various aspects of endgame play (the material divided into what Nick Pert and the Ginger GM team consider appropriate for under 1000 elo rated viewers, 1000-1400s and 1400-1800s respectively) while the final part is a collection of four practical examples of endgames played in Grandmaster games. A series of puzzles follows each section, the positions relating to the lessons that the viewer has just seen. rook v 2 pawns on the sixth. king & pawn endings: the Outside Passed Pawn. Back in February (TITE II) I listed 19 positions that I though might count as a basic knowledge of endgames. 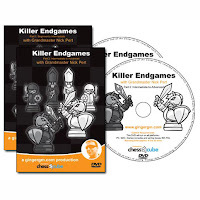 Of those, as well as other things, the first DVD in the Killer Endgames set will help a person solve positions 2, 3, 4, 5, 8, 9, 11, 12, 15, 18 and 19 at the very least (five of the others you'll need DVD II to help you). One thing that you couldn’t tell from the raw list of contents, however, is the extent to which the DVD focuses on king and pawn endgames. 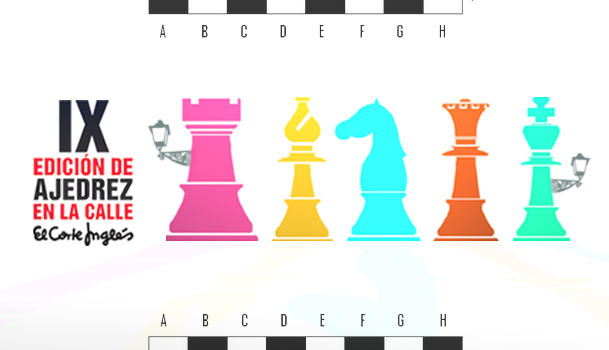 The concept of 'opposition' is covered in three segments and the outside passed pawn in two, while nine of the sixteen puzzles in the various sections are king and pawn positions. This emphasis strikes me as entirely appropriate. 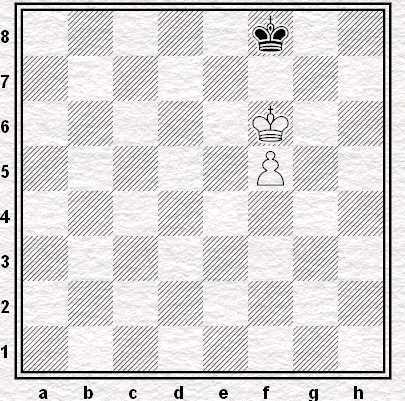 As has often been pointed out, king and pawn endings are fundamental to all endgame play. 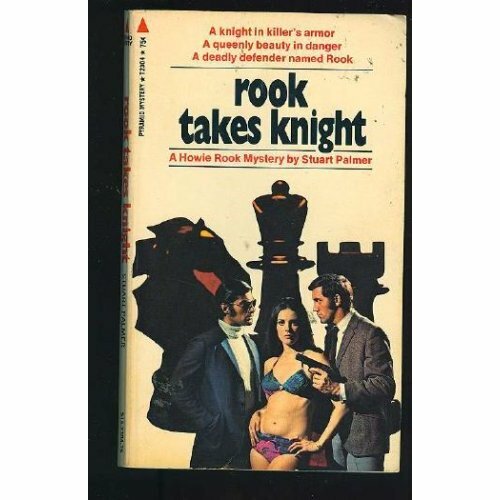 It would be impossible to understand how to play rook and pawn endings, say, if you didn't know when you could exchange the rooks and when you couldn't. Take my final game from this year's Slater-Kennington Cup, for example. 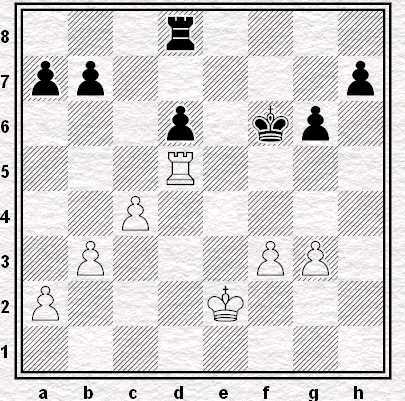 Yet another king and pawn endgame for me, it turned out, to add to those mentioned in TITE VI. 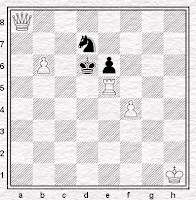 This is a fairly typical example of how a king and pawn ending might arise in club players’ games, I think. Black (your humble scribe) is a pawn up, but White has a bishop which plays on both sides of the board. With a computer running beside me I can now say that Black is probably just winning, but I certainly wasn't sure of that at the time. What I knew was that I wanted to play 42 ... b5-b4, and that the first thing to check was whether White could just try the obvious 43 Bxf6 in response. 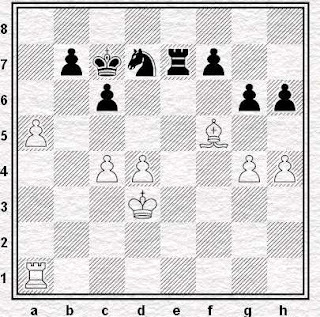 The piece exchange does indeed lead to a win for Black, although to realise that that you have to see Black's idea at move 48 from the start. White either missed my intention or thought swapping off was the best practical chance. Either way, he went for the endgame and I had the very unusual experience of foreseeing the position in which he resigned on move 53 some eleven moves before it actually happened. That’s the thing about king and pawn endings, though, isn’t it? Not only is it possible to accurately calculate a long way in advance – there being fewer pieces on the board and (sometimes) fewer lines to consider – but often you have to. In this type of ending assessments like ‘slightly better’ or ‘clearly worse’ disappear leaving only ‘won’, ‘lost’ and ‘drawn’. Like earlier Ginger GM releases (e.g. The Killer French), Killer Endgames will run on standard DVD players as well as computers. The only difference is that instead of Simon Williams, it's Nick Pert behind the shades, but while the two GMs' styles are certainly different, there has been no drop in the clarity with which the material is explained. Although Pert talks about the 'opposition' he never actually stops to define the concept and the viewer is left to infer what is meant from what s/he sees on the screen. While this is not so much of a problem for somebody refreshing their memory, a complete beginner might find it harder to pick the ideas up. White needs it to be Black's move if he's going to win. The more experienced chessers amongst our readership will not need me to tell them that while this is true if you push the pieces further down the board, with the Black king on the back rank White wins regardless of whose turn it is. 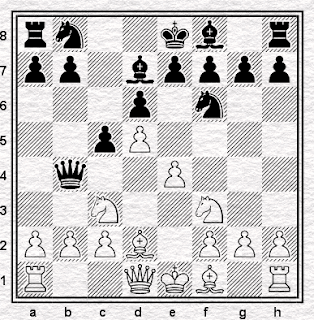 Finally, while the Outside Passed Pawn coverage was good, I think it was a mistake not to follow it up with a segment or two on Protected Passed Pawns. It seems to me these concepts go together and that teaching beginners one without the other could potentially leave them in a bit of a pickle. and believe that Black is doing well. Black has the OPP, after all, and Pert has told us, quite rightly, that it's usually good to have them when you're playing an endgame. This is true enough, but the problem is that he hasn't told us that PPPs are even better. 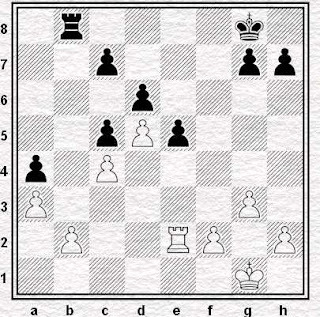 As it happens Black is simply lost in this position regardless of what he tries or who it is to move. 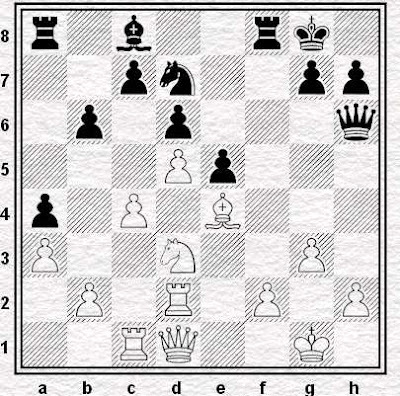 As I write this it occurs to me that my ending from the Slater-Kennington game is another example of a Protected Passed Pawn trumping an Outside Passed Pawn which only reinforces my belief that it would probably have been best to cover these concepts as a pair. I suspect these issues are mostly the result of Killer Endgames being a DVD. I shall cover books v discs in a later post (sneak preview: my feeling is that each format has its advantages and disadvantages) so I’ll say no more about it for now. The fact is that, the quibbles outlined above notwithstanding, for the vast majority of the time the material is both entirely appropriate for the target audience of the DVD and taught very well. I'd certainly say that Killer Endgames meets its goal of teaching those who are developing their endgame knowledge from scratch just what they need to know. Actually, it could also potentially be of benefit to people some way above the 1800 elo ceiling suggested. I’m currently about 1950 elo equivalent (163 ECF) and hope to be another fifty points to the good when the next grades come out, but there was plenty on disc one that was useful to me. I don't just mean as a refresher either; I've never looked at rook v minor piece positions before, for example. So that’s the end of the review part one. After Benasque I’ll be back with a closer look at disc two and a post on what you can expect from books and DVDs. For now, I’d say that if you’re looking to learn something about the endgame, and the topics listed above are unfamiliar to you, you might well want to make Killer Endgames one of your candidate moves. You can buy it from Chess & Bridge or direct from the Ginger GM himself. £25 for each DVD or £45 if you buy both together. So, you've not been wondering, how did the simul go? I actually won all my games except the one reproduced above, my opponent in that one being an oldish guy, not the strongest opponent I faced but good enough to win without difficulty once I'd gifted him both my centre pawns. I was probably lucky that I only lost the one, having found myself particularly struggling against two kids, both of them from a Bulgarian family (whether resident in Zaragoza, or on holiday, I didn't ask) and neither particularly pleased when I managed to turn the game around. Another of their party made - unlike the gentleman who beat me - the mistake of playing a suspiciously coherent opening (1.d4 d5 2.Nf3 Nf6 3.c4 e6 4.Nc3 Be7 5.Bg5 O-O 6.e3 b6) thus inadvertently tipping me off that he knew what he was doing. I made good and sure to spend extra time at his board and won a hard-fought game. In some ways that was easier than another game in which I played against a child who, although she claimed otherwise, evidently didn't know how all the pieces moved. I hadn't intended, in point of fact, to write about the simul, since I wasn't sure that I would have anything new to say. However, there was one thing which came out of the experience which I haven't seen written about at all. That thing was backache. A few hours after the simul I was walking around like a rather less agile Quasimodo, and I couldn't properly walk upright, for any length of time, until at least two days afterwards. I've had a bit of back trouble in my time - and trouble with my cervical vertebrae, which enables me to make a cracking sound simply by moving my neck - so it's not so surprising that I should have another bout. The activity itself strikes me as carrying a serious risk of provoking back problems to anybody similarly vulnerable, which must include a lot of chessplayers. You lean over, make a move, go to the next board, lean over, make a move, go to the next board, lean over...I played for three hours, which I don't suppose is unusually long, so in that time I must have made that movement hundreds of times, perhaps close to a thousand. This can't be good for one's physical health. You're more likely to suffer from back trouble when you get older. I'd guess that a fair proportion of people who give simultaneous displayers are in that category, and hence a fair proportion of them must also be vulnerable to back trouble. So when you're playing in a simul, maybe have a thought for the poor bloke, if bloke it be, doing all the rushing around and bending over - and beating you, easily or otherwise. The pain you're feeling is purely metaphorical. And at least, when you walk home later, you'll be able to walk upright. From out of the night and the darkness came a speeding car to strike down a man. To the district attorney it was only a matter of waiting until after the funeral to arrest lovely Deirdre Charteris for her husband's murder. But Howard Rook, the burly, ursine, chivalrous, argumentative newspaperman, true-crime writer and occasional defense investigator, made up his mind to see to it that the lady wouldn't spend even one night in jail. It was in her great-grandmother's old polished mahogany workbox, which now belonged to Marianne's mother. It wasn't used as a regular everyday workbox for darning or mending or dressmaking, but was brought out occasionally for Marianne to look at and tidy up - generally when she was ill and tired of her own toys and books, and needing some extra amusement. The workbox was charming, and Marianne loved it. It had a tray lined with green satin and fitted with little tools with mother-of-pearl handles, for all sorts of elaborate, out-of-date needlework; little satin-covered boxes with mother-of-pearl knobs on the lids, and a space underneath the tray, in which were all sorts of treasures that Marianne's great-grandmother and grandmother and mother had somehow collected. There were buttons of every kind, ivory lace bobbins, mother-of-pearl counters, an odd chessman or two, short lengths of ribbons, buckles, sequins, beads. Among them, this particular time, Marianne found the pencil. Games were more difficult. She drew something as much like a chess-board as she could manage, with some of the pieces on it as if a game were being played; and she was careful to draw box beside the board the hold the rest of the chessmen. She put in some draughts, because they could use the same board, but it was very difficult to draw things so tiny. She tried to draw a pack of cards, but found it impossible, so she drew a little pile of cards on the table and hoped that her thinking of them as playing cards would make them turn out to be just that. Her best effort was the bed. She drew a four-poster, having always longed for one herself, and it rather dwarfed the room. Even the table looked small by the side of the bed, but Marianne felt that it didn't much matter, as Mark was, after all, still an invalid and would have to spend most of his time in bed. She drew several blankets and an eiderdown, pillows and sheets. Food! Mark had mentioned that he would like some decent food. There wasn't room on the table for anything more - it was already overloaded with large chessmen, draughts and cards. "It does seem a bit crowded," Mark admitted. "What's there, anyway? I saw a lot of boxes and things, but I didn't look properly." "There's a chess-board", Marianne began. "Wait a minute, I want to make sure of something." She opened the box beside the chess-board and looked in. There were pieces, she was glad to see. She put them out of the table and counted. With the pieces on the board there were thirty-two. "Mark", she said, "how many chessmen should there be - in a whole set, I mean?" "Thirty-two. Why? Aren't they all there?" "Yes, they are. And it's fifty-two cards in a whole pack, isn't it?" "Yes," Mark said. He looked slightly surprised as Marianne began to count the pile of cards on the table. "Why on earth are you doing that? Why shouldn't they all be there?" "Because I couldn't draw them all separately, so I didn't know - forty-one, forty-two, forty-three - wait a minute." "Yes, it is a complete pack", she announced a moment later. "Good. The the draughtsmen will all be there, I expect." She looked, and they were. "Look here", said Mark impatiently, "what is all this? Why are you so suspicious about everything not being there? Who'd have taken a chessman anyway? Why should they? It's not the sort of thing THEY want." "Who want?" asked Marianne, but without waiting for a reply she began to answer Mark's questions. "Because I drew it. I drew it all, so that you'd be more comfortable. I drew the bed and the books and the table and things - only I'm not very good at drawing and I couldn't draw the things on the table small enough and I couldn't get everything in, and I had to draw a box for the rest of the chessmen instead of drawing the whole lot, and the pack of cards and not each card, so I wanted to make sure they were all there." "I wish you could get me out of here", Mark said, suddenly gloomy. "I could try". I could draw you walking down the path away from the house, looking very pleased with yourself." "I told you, I can't walk." "But you will be able to. Perhaps if I drew you walking..." Marianne stopped. "I'd rather not say. Anyhow you wouldn't like it if I did. And I want to ask you something else. Mark?" "What did you mean when you said the chessmen weren't the sort of thing THEY wanted? When I was counting them?" Mark looked quickly at the window, and away again. He was suddenly wary. "I don't want to talk about it", he said. "He's got enough books", she thought, looking at the drawing of the bookcase, which was indeed as full of books as she could make it. "And chess, and draughts, and cards. I can't think of anything else." She turned her attention again to the outside of the house. The hills in the distance looked bare. Marianne added tiny trees and a sort of thick pencil fuzz for bushes at the foot of one or two of them. On the top of the highest hill she drew a tower, round and squat, with battlements on top. She had had no idea of what sort of building it would be, but when it was finished it reminded her of a stubby lighthouse. She put slit windows up the walls and an extra dome-shaped top above the battlements, where there could be the light. "It shines out to sea", she said to herself. "Everyone can see it for miles around." 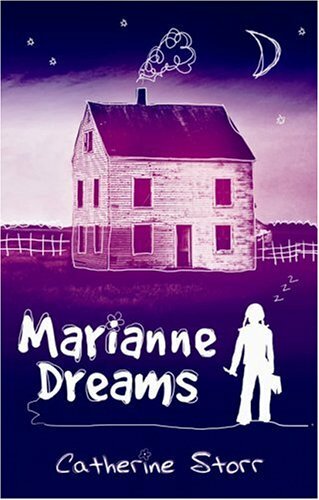 Marianne had never been in the house for so long before: nor had any time of waiting seemed so endless as the long day that dragged on as she and Mark waited for the night to come. Sitting on the bed, on the floor, on the stairs for a change, they played all the card games they knew, they played draughts, they played chess, they played Monopoly twice through, they even played noughts and crosses. Every now and them one of them would take a quick survey through a window, careful to keep out of sight themselves. The Watchers seemed to be no nearer; but even Mark admitted to feeling their unrest and expectancy. The atmosphere in the house grew tense: both Mark and Marianne became more bored and irritable as time passed and the half-light outside persisted in its pale hard sameness. It seemed as if the dark would never come. "You can't move your king and castle together after the king has been checked," Mark said sharply as they were playing their third game of very inexpert chess. "Yes I can! It doesn't make any difference whether he's been checked or not!" "No, it's one of the rules that you can't castle if your king has been in check." "But I always play like this." "Then you always play wrong," said Mark disagreeably. "I don't! Anyway my father taught me how to play and he knows better than you." "Then your father simply doesn't know the rules any more than you do." "He does! And anyhow I'm going to castle," Marianne said, moving the pieces. "You can't! Put them back and play properly!" "All right then, I will," Mark said. He leant across and reached for Marianne's king. At the same moment Marianne moved the board sideways to get it out of his reach. Mark's arm caught the taller pieces and swept them to the floor. "Now look what you've done!" Marianne said triumphantly. "You're obviously," Mark said, in a voice that trembled with rage and sarcasm, "much too young to play an adult game like chess. I should think tiddlywinks would be much more suitable for your age." He slid off the bed, with the chessmen's box in his hand, and felt about for the pieces that had dropped. Suddenly, in a completely different tone, he said, "Marianne!" "What?" said Marianne, still furious. "I can't see properly to pick the chessmen up." Marianne looked quickly round the room and out of the window and and saw that at last the pale light had begin to fade.Outside it was like a winter twilight: in the room it was already so dark that, as Mark had said, it was difficult to distinguish one object from another. "It's getting dark!" she breathed. Mark retrieved the last chessmen and stood up. "Thank goodness for that. We seem to have been waiting hours. Now what?" He slid the chessmen back into their box. "I think we ought to turn the radio on." "Oh, no!" Marianne cried out. "Don't let's have it! It's horrible! It frightens me!" "Yes I know. But it could be useful. Don't you remember what you said the first time we heard it? It tells us what THEY are thinking." Last weekend, Kirsan Ilyumzhinov made a visit to a country with a long record of human rights abuses and a complete lack of democratic government. During his visit, he played a game of chess with the country's political leader. Hang on. Was that not the photo you were expecting? But I said last weekend. The other chap was the weekend before. No, last weekend Kirsan was in Vietnam. With its complete absence of democracy. And its very long record of human rights violations. Whatever. 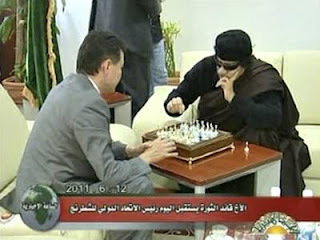 Anyway, I wrote a piece about Kirsan's visit to Libya at the time, which I was going to run on Wednesday last week. And I changed my mind, it being, coincidentally, my birthday that day. Politics and war and dictators seemed far too serious for a birthday, so I dropped it, substituted something harmless and went up to the mountains for the day. But it's been nagging at me that there was something I wanted to say. So I'll try and say it now. One of my persistent, albeit occasional, themes in writing about chess politics and media is the difficulty which the chess world, in Western Europe and North America, has in understanding the point of view of the rest of the world. The reason being, chiefly, that it does not try. Because it doesn't understand, it doesn't really understand how Kirsan works, not entirely, and understands still less, how he gets away with it. It understands that he's corrupt, that his friends are crooks, that he silences some people and buys others, that the structure he controls is a parody of democracy, of course. That's well understood. But it doesn't understand that, however things may look from here, they may look differently from elsewhere. Specifically, what looks like justified moral outrage, from where we are standing, often looks like selective outrage, not to say hypocrisy, when viewed from elsewhere in the world. So, Kirsan goes to Libya, in the middle of a war, one of whose causes is the de facto leader of that country, with whom he has a friendly meeting. How could he? we ask. Doesn't he care about who he associates with? we ask. Doesn't he realise how this looks? Do me a favour. How could he? Because he can. Doesn't he care who he associates with? Course not. He never has. Doesn't he realise how it looks? Of course he realises how it looks. But it depends on who's doing the looking. What he probably didn't ask himself, all that much, is how it was going to look to you. Assuming that you are in the West. This isn't because he's bad, although he surely is. Nor because he's mad, although he probably is not. It's because his constituency isn't you. It isn't, by and large, the West. And this, it seems to me, is the point that nobody was making any effort to see. Or understand. It's a constituency that's largely located elsewhere and one which may take a different view of Western military campaigns than is normal in the West. One which may not believe that when the West starts bombing somebody to whom they were cuddling up just yesterday, it's because of a deep commitment to human rights. One which may hold a jaundiced opinion of a system of political ethics which barely notices a dictator until it's time to have a war with them - but then, when that war happens, demands that everybody else organises their moral outrage around the same new-found priorities. 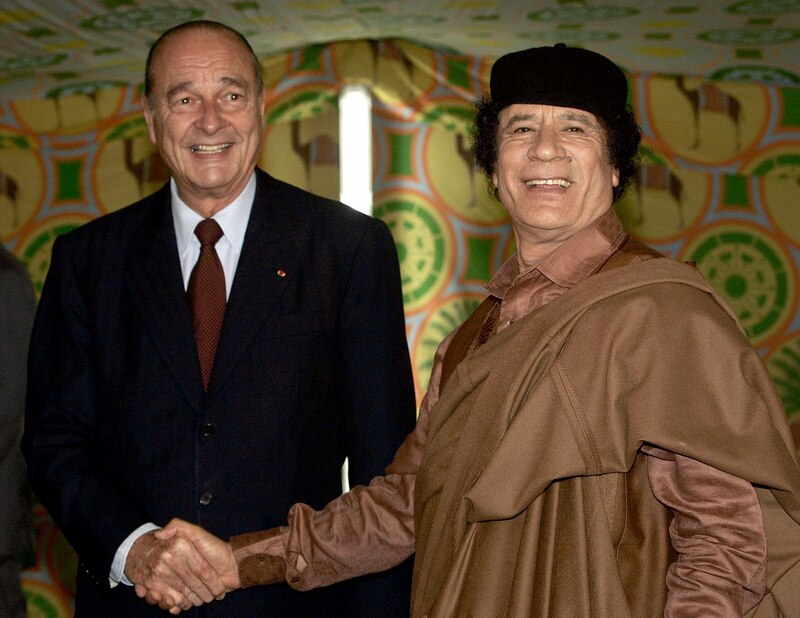 Suddenly the same countries whose leaders were queueing up to be photographed with Gaddafi are crying out that Gaddafi's the one person in the world you absolutely can't be photographed with? Some people might be just a little bit sceptical about that. And they might be just a little bit right. You can see their point of view, can't you. No? You can't? Well, then maybe they can't see yours either. Which is why the West has never been able to cope with people such as Kirsan, or Campomanes, or for that matter João Havelange, all of whom have understood very well how much resentment there is, outside the West, at Western intervention in other countries. Not that they care, I hasten to add: on the contrary, all the three individuals named in the paragraph above have been good friends not just to dictators, but to corruption on a considerable scale. 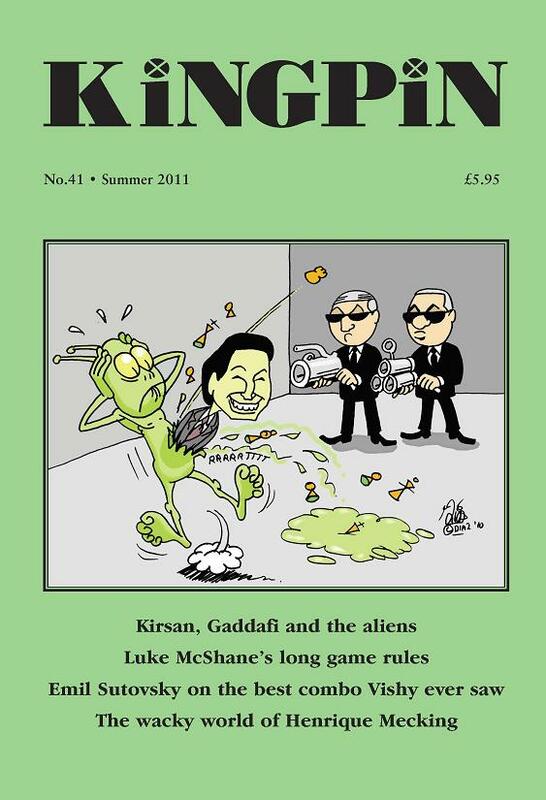 Kirsan's allies in FIDE consist in good part of the corrupt, the bribed, the paid-for, just as was true of Campomanes before him, just as was true of Havelange in FIFA (and for that matter, of Blatter now). There's nothing principled about Kirsan. Far from it. The man is 100% cynical. Though not necessarily more cynical than the policy of buying dictators one day and bombing them the next. What I'm driving at is that there's such a thing as public opinion, to which any politician has to play: and that public opinion outside the West is not necessarily the same as public opinion inside it. And hence it's possible for a politician to play on genuine resentments of what is perceived as an arrogant and hypocritical West. And how do we deal with that? By being the arrogant and hypocritical West, and making no effort to understand why other people have a different point of view to ours. (I am painting in very broad strokes, since "we" and "they" represent many millions of people with many millions of opinions, but as a generalisation, I think the picture fits.) One way in which this manifests itself is in the habit of picking and choosing who we decide to support and encourage, and who we decide needs to be bombed, and then making a huge moral noise about it whenever we do the latter. So, when I read about Kirsan's flight to Tripoli, I wasn't outraged. I just laughed. I laughed at the sheer cynicism of it. But I wasn't outraged. He's just playing to an audience. He's playing to an audience that doesn't see The Most Evil Dictator In The World. It may well see a couple of dictators, and ought to. But it also sees a capital city under bombardment by (for want of a better phrase) the West. It may or may not care how Kirsan looks. But it may also think about how the West looks. And, you know, I don't see that meeting Gaddafi now is particularly more outrageous than meeting him when most of the photos in this piece were taken. The venality of a government really ought to be measured by their actions. Not by whether somebody's decided to go to war with them. That's the point where you can count me out. 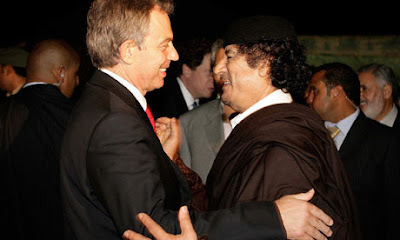 Everybody knew that Gaddafi had a very long history of very serious human rights violations when they were paying him, and taking his money in return. Well, perhaps not everybody in the world knew, but everybody who was taking his money did. And everybody who was paying him. So I'm kind of reminded of Tartakower's refusal to act against Alekhine, after the war, because of the latter's anti-Semitic articles. You all knew what he was like, said Tartakower, but back then you preferred to accept it. I think I am with Tartakower here. People kept their mouths shut and took his tainted money. Now to be fair, that's the usual standard of ethical due diligence (or any kind of due diligence) obtaining in sport - or, for that matter, in international relations. Tell us about your money, and we'll ask questions later, if we ask them at all. I don't like that, but I understand it. But if that's the game, I'm not going to then turn cartwheels of moral umbrage when people decide they don't want to play any more. 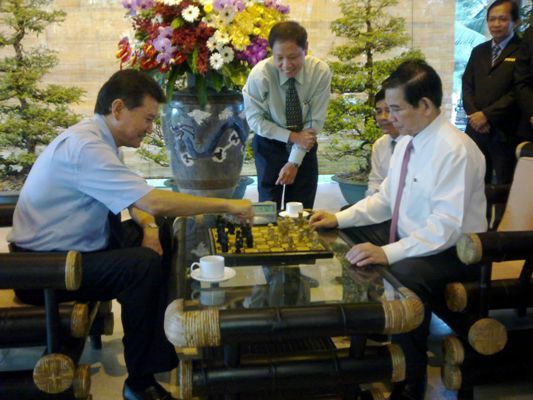 So let's complain, yes, when FIDE presidents make friendly visits to dictators. But let's not reserve our special outrage when it's one on whom we happen to be dropping bombs. That, to me, is what makes a mockery of the whole process of promoting human rights: when it's partially and conveniently applied, and when it's accompanied by war, so that instead of a genuine support for human rights, it just becomes a card that's played in pursuit of an aggressive foreign policy. That's the sort of thing that makes people cynical. It's the sort of thing that's made me cynical. And disinclined to go along with the periodic fits of morality which accompany it. 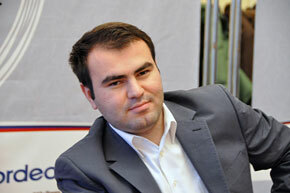 So - if people want to spread their outrage a little more widely, and look into the use of chess to promote chess in repressive states generally, if people want to make it policy that we should ethically audit hosts, and sponsors, and who the President of FIDE goes to see, then that's something else. How often do questions of human rights come up in relation, for instance, to tournaments in China? 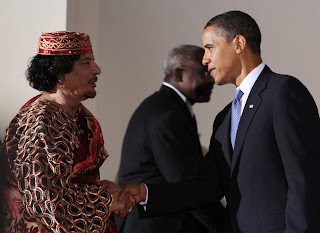 If people want to complain about visits to Libya, perhaps there's a case for complaining about visits to Vietnam? Or visits to Sri Lanka or Iran? I'm not going to be outraged when Kirsan does what half the political leaders in Western Europe did just recently. You be outraged, if you want to. That's OK. There's good reasons. 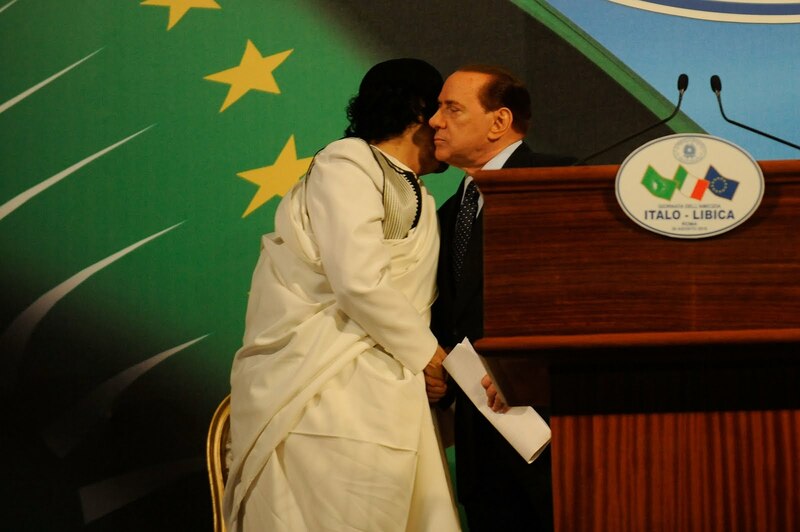 Kirsan is what he is and Gaddafi is what he is. But perhaps other people order their priorities differently. Perhaps I do. Perhaps I'm not going to keep track of who's on the moral outrage list this weekend and who's the beneficiary of constructive engagement. Of whether we're at war with Eastasia or Eurasia. Godmund, the White King and Hrosmunda, his Queen, live in warmth and peace with their people in the garden. But one day a coldness arose between the King and the Queen, which allowed the enemy, the Red Horde, to invade the garden, led by a serpent with the head of a man. 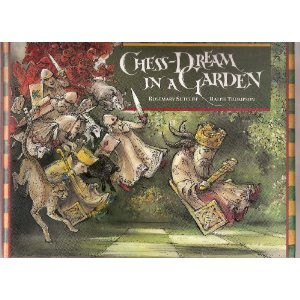 Then the chessboard at the centre of the garden becomes the battefield for the battle to end all battles. In fairness, even the finest arbiters will occasionally make misjudgements, but serial incompetency ought to be eliminated. The problem is that currently, short of committing downright fraud - such as submitting fake tournament tables - no one is ever going to be stripped of his IA title, regardless of how bad it may be. How does that differ from the Grandmaster title? It's Kingpin time again: the new issue is, at last, on sale. Available from the usual outlets and conceivably directly from the magazine itself, if you can work out how. You can always email the editor on kingpinchess@yahoo.com. All sorts of promising-looking stuff in it, but of course you'll be most interested in the two pieces the present writer has contributed, including the single most hostile book review I have ever written. 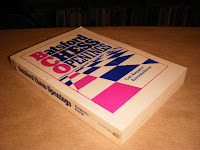 Well, if it wasn't the worst chess book I'd ever seen, I'd have written a different review. Anyway, do read it. Come to that, do buy it. Buy and enjoy. Every Picture Tells A Story: Big Pics Have Little Pics Hanging Up Inside ’Em…. Number 13 in a series of collaborative posts, this one by Martin Smith - the fruits of a theoretical discussion with Richard. Take a look back at the three versions of the painting of the Hereford Gents playing chess: “Hereford” (which you can see here), “Greenlees” and “Christie’s” (both here). All of them have pictures within the pictures, they are on the walls, and Richard and I have puzzled long and hard over their source and significance. They appear in identical positions in all three versions: on the left-hand wall of the room, where there are three different pictures; and over the fireplace where the picture stays more or less the same, and this is where we start. 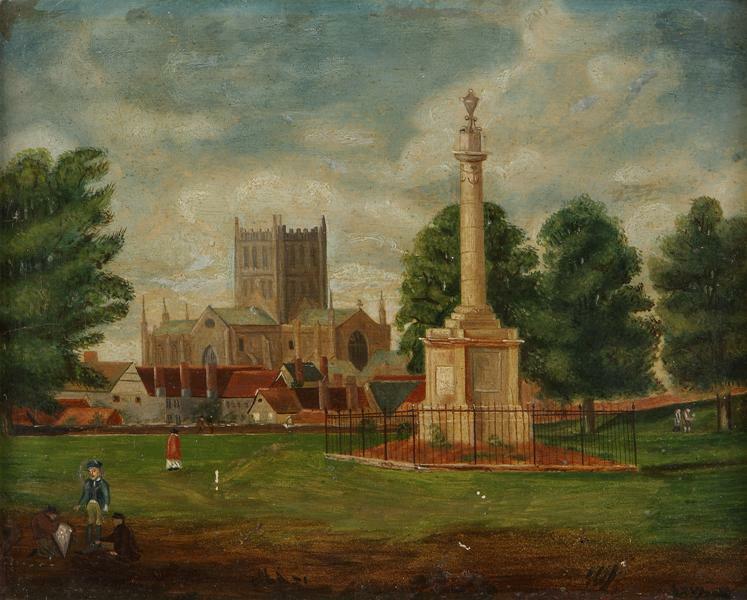 It is recognisably a distant view of Hereford Cathedral across Castle Green, with Nelson’s Column, erected in 1809, prominent in the composition. It is a prospect that would have been much painted by artists aiming to surf the wave of the Nation’s euphoria after Trafalgar. 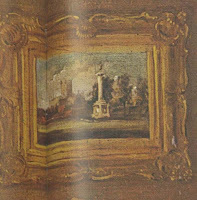 But the Christie’s equivalent is just a splodge of white (you can see it at the back of the full picture via the link above) which, with imagination, could be seen as relating to the pedestal of the column. 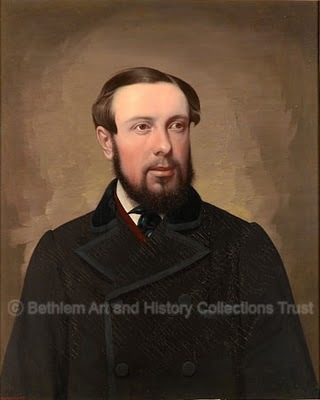 As with so much in the Christie’s curate’s egg of a painting, some parts, eg the miniature portraits, are good enough to have been painted by Leeming himself. But other parts are not, including the painting on the back wall. So was there actually a painting of the Cathedral view on the wall of the room that was then copied, in miniature, into the Gents paintings? We got quite excited when we discovered that there was a candidate, sitting in storage in the Hereford Museum and Art Gallery, artist unknown. The view is the same, but there are some telling differences from the Leeming miniatures: the figures in left foreground, and the trees, for example. It’s close, but unfortunately not close enough, and anyway not of the standard (clearer when seen in the flesh) to pass muster in a room of this quality. So the Cathedral view appears definitely in two, and probably all three of the versions, and in each case is a reminder to the viewer that these are Gentlemen of Hereford playing on home turf. But otherwise there are no correlations among the wall paintings. So we’ll take them one by one, and first up is the portrait in “Hereford”. It is rather indistinct here although, again, the original in the Hereford Art Gallery is clearer. 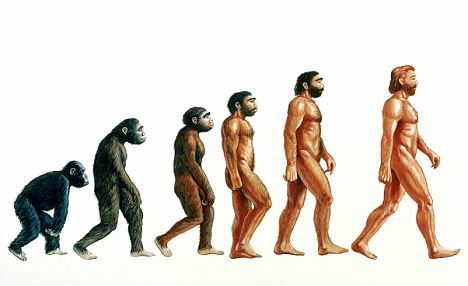 In spite of some efforts, we have not made any progress finding a source for the image. Maybe it’s a family portrait, or maybe, given that we now know that Leeming copied the Magdalen Christ, it has a religious theme. But we will leave it for now and come back to it later in this post. 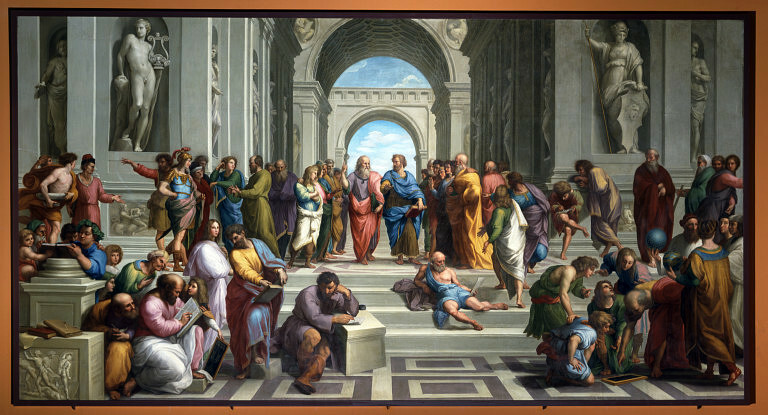 Let's move swiftly on to the figure painting in the Greenlees version. in the little dining room at Petworth House, Sussex. Seghers, a Flemish artist working in the early 1600s, reversed the pose compared with the later Leeming, and put an angel into the action. 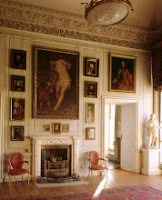 However, the picture was in England in Leeming’s time, in Lord Egremont’s Petworth House, Sussex, where it has hung ever since. 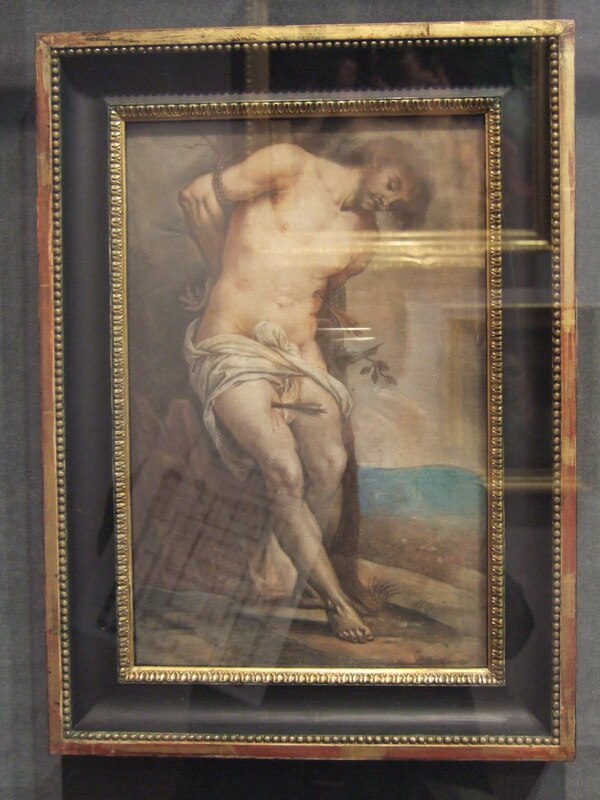 But while possibly it is the source for the Greenlees St. Sebastian, looking at the closer correspondence with the Jan Thomas we’d still feel more comfortable if we could establish a link, even at several removes, between his painting and Greenlees’ mini-version by Leeming. Now we come to the picture on the left hand wall of Christie’s. We are looking at it last, but certainly not least. We had noticed this image back in September last year at the Christie’s auction but without understanding what we were looking at. Only in April this year did we realise it was a mini-version of Leeming's copy of Christ Carrying His Cross for Hereford Cathedral which we talked about in this blog. The striking similarity made us think again about what Leeming was up to with the pictures on the walls. We had assumed that he was making these mini-pictures to personalise each version of the Gents appropriate to their dedicatee, or whoever commissioned them, perhaps copying an item from their private collection. 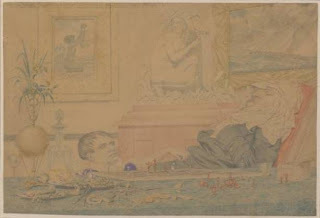 But the Christie’s Christ image suggested otherwise, that perhaps Leeming was copying his own work. 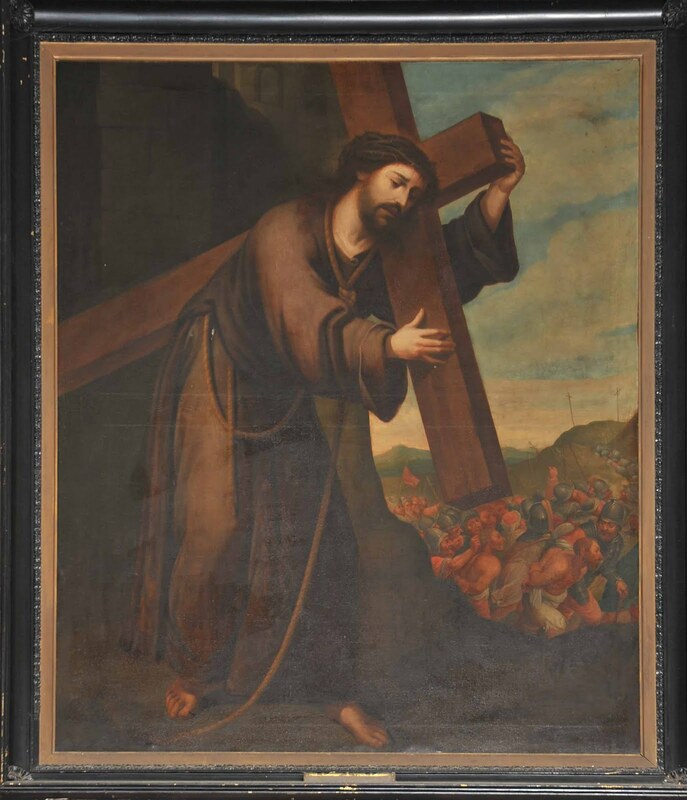 Of course, given what we have said above about the unevenness of the Christie's version, the Christ mini-copy may not itself be by Leeming’s own hand, but possibly by a lesser talent under his direction. But nonetheless, the source appears to be Leeming's copy of the Magdalen College original. If this is right, why then was Leeming putting copies of his own work into the Gents? We suggest that he was taking the opportunity afforded by these paintings to advertise his skills as a copyist. The mini-pictures were an ingenious, and opportune, prospectus for his work. Moreover, by referring to prestigious old-master works, he gave his chess paintings, and through them his patrons, an additional caché of connoisseurship, to everyone’s advantage. 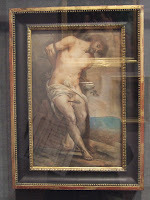 If this is so then the Greenlees version with its mini St. Sebastian, which was shown in the Royal Academy Summer Exhibition of 1818 – then, as now, a popular place to show-case your talents in the competitive London art scene – may hint at the sometime existence of a real-size copy by Leeming of an old-master original. Well, if there was, and it still is around, we haven’t found it yet. But his obituary refers to Thomas copying yet another, and these days rather well-known, old-master work, and that is highly suggestive. 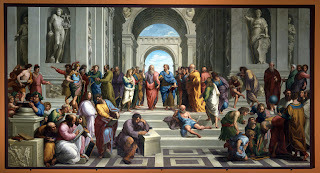 He copied, towards the end of his life, Raphael’s School of Athens, perhaps not the original itself, which is huge and in Rome, but probably one of two smaller copies already in London. This, the better known of the two, may have been the one. executed in 1755 and now in the Victoria and Albert. Leeming's reproduction was unsold at the time of his death, which was only four years after the 1818 RA show. 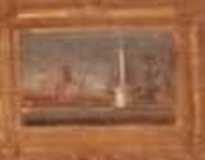 As with the Magdalen Altarpiece, it is a copy of a high-end work, suggesting he may have done others, with the Seghers/Paulus Pontius, or Jan Thomas, St.Sebastian as a candidate. Continuing our train of thought and looking now for a source for the portrait on the wall in the “Hereford”, well, Leeming had painted many portraits of course, so he would have had plentiful raw material at hand. But it opens the intriguing possibility that it may be a copy of a portrait of a high-status subject by another artist, or as we mentioned above, of a religious figure, another Saint for example. Such pious imagery would have had resonance for the Bodenhams of Rotherwas Hall, where we think the Gents were playing chess. They were a long standing Catholic family, and may even have commissioned direct copies (by Leeming, or others) of the religious works upon which the mini-copies were themselves based. 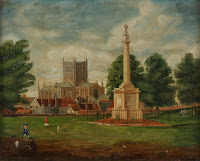 As for the landscape view of Hereford Cathedral: admittedly we have not seen any references to any other landscapes by Leeming – apart from a small local scene in the Hereford Art Gallery’s collection – but the installation of Nelson’s Column on Castle Green was a major, and even locally controversial, event perfect for this market-savvy artist to exploit. 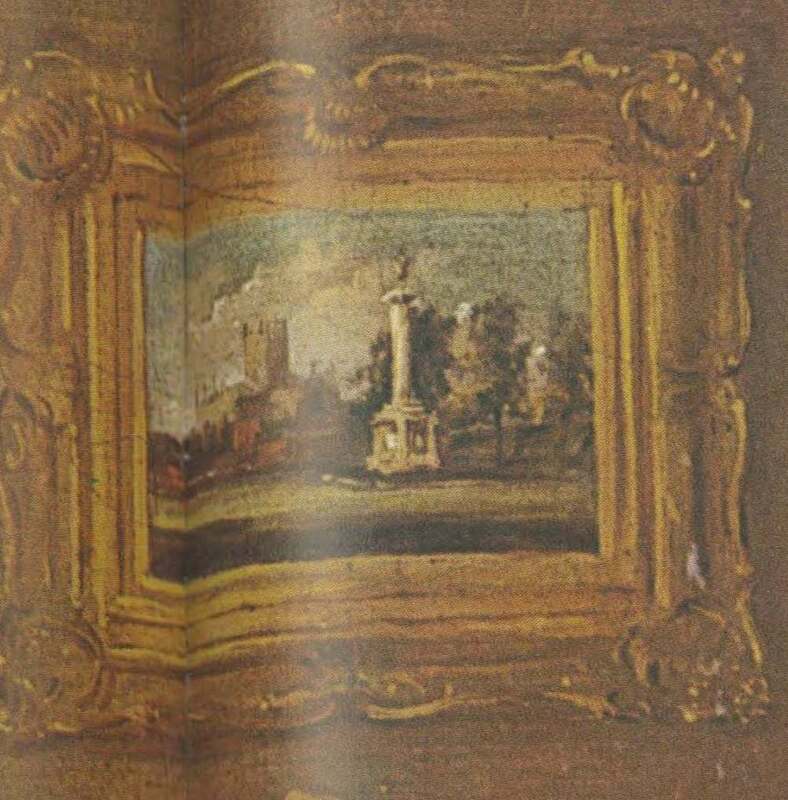 Leeming, we suggest, was taking the opportunity provided by the Gents to set out his stall as a skilled miniaturist, accomplished copyist (as his obituary emphasises) and perhaps even competent landscape painter. It is a speculative theory, with several levels of conjecture, built on a narrow foundation of evidence, but not, you might say, completely off the wall. We are now patiently waiting for the missing pictures to show themselves and provide the buttresses to hold it up. I'll be on a train to Gatwick later today, another weekend of e2-e4 chess ahead of me. Sunningdale already seems like ancient history, and chuffed though I was to win my first tournament in twelve years (and only the second ever), this is no time to rest on my laurel. There won't be much time to relax after Gatwick either, as I'm heading off to Benasque for the first half of July. All this chessing is really getting in the way of blogging. 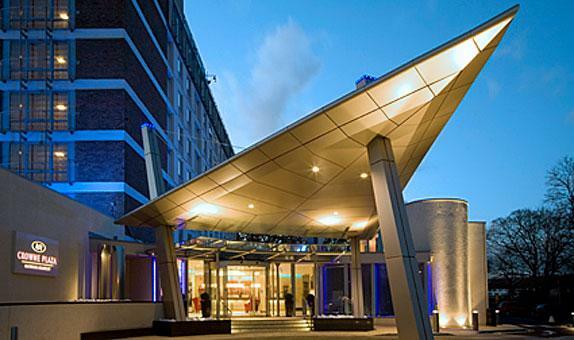 I want to write a post or two about my Sunningdale experiences and I've already got posts in several series - Letter to the Editor (I, II, III); Sing a Song of Chess (I, II, III, IV); The Interesting Sacrificed Exchange (I, II, III, IV) - that are waiting to be written. 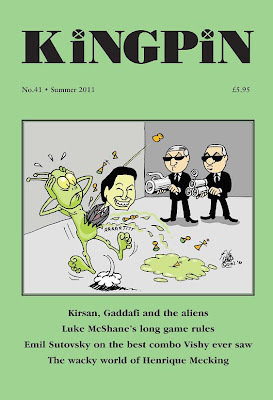 As well as that lot, I really must get back to the Anti Chess (I, II) story sometime soon. Chess blogging zeitnot! Something else I must get around to is that review of Nick Pert's Killer Endgames DVDs. My plan is to do something in depth on Disc One at some point between Gatwick and Benasque. For today, though, I'll kill two birds with one stone and take a look at how the Ginger GM's DVDs helped me win an important game at Sunningdale. It was the morning round of the last day. We had reached the position at the head of today's blog when, just as I was about to play my original intention (the simple ... Nf6 followed by lobbing my pieces in the general direction of White's king), a thought occurred to me: what about ... Nc5? My silicon friend doesn't think much of the idea - after a couple of minutes to think, the BIM considers Black to be clearly better after ... Nf6 while ... Nc5 is only it's twelfth choice (behind such moves as ... Re8, ... Rd8, ... Ra6 and ... Ra7) - but nevertheless there's a rather attractive idea behind it. "White will have to swap", I thought. "I'll take back with the b-pawn, exchange everything off except for one rook, stick that on b3 and then just sit on White's position until it breaks." A Blue or Red Pill? moment, then. Play for a direct attack or head for an endgame? Frankly, I found it very difficult to make the choice, but in the end, three factors tipped the balance in favour of trying ... Nc5: the Killer Endgames preview clip that we had on the blog last week (TITE VI), the memory of a game I played at Golders Green back in January and the amount of time we each had left on the clock. If you watched the Killer Endgames preview video you will probably remember this position. I hadn't seen the whole DVD before I went to Sunningdale, but, fortunately for me, I had at least seen the this clip. It seemed to me that there was a similarity between what I wanted to do and Karpov playing 1 Bxd7 followed by moving his rook to the f-file and eventually to f6. 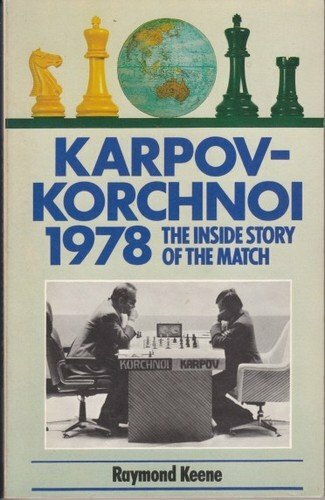 True, unlike Karpov, I wasn't going to be trying to create a passed pawn, but I was going to get an active rook while my opponent's rook was going to be stuck passively defending a pawn just like Hort's was. If you watch the video again, you'll notice how often Pert talks about the importance of having active pieces in rook endgames. This is hardly an original observation, of course, but it's an important one and in retrospect given the emphasis he puts on this point, it's not really surprising that the thought should come to mind at the point that it might prove useful. Once I'd begun thinking about active rooks another position came to mind: one from a rapidplay game from January's Golders Green tournament. My opponent, playing Black, had offered me a draw, but I declined because I could see several factors in the position that were in my favour, not least the relative activity of the rooks. I did indeed go on to win the game, but it was more my opponent's reaction afterwards - as soon as he resigned he announced that the diagram position is a simple draw - than the result that encouraged me to play ... Nc5 in the game at Sunningdale. My feeling, you see, was that regardless what an objective assessment of the position might be, my chances of winning were pretty good and that weaker players, by which I mean people around my strength, often underestimate the difficulties of holding such positions. Sitting at the board in Sunningdale I remembered Golders Green and felt that if my opponent there had allowed me to get such an ending and then not manage to save it something very similar could well happen again. Finally, there was the clock; the thirty-third piece, as T.C. calls it. At the point I was deciding between ... Nc5 and ... Nf6 my opponent was already down to his last thirty minutes while I had a little short of twice that. I felt that even if he managed to reach a defendable position, the pressure of having to find a decent move once every thirty seconds (the time control at e2e4 events is all moves in 90 minutes with a 30 second increment from move 1) would eventually tell and sooner or later he would crack. ... and I went on to win the game in pretty much exactly the way that I'd imagined at move 23. I was even right about White's time trouble: at one stage just before the end he had seven seconds left to my three-quarters of an hour. During the game I wasn't too bothered whether heading for an endgame was the correct thing to do or not. I was just trying to win and the rook ending seemed like a pretty good way to try to do that, while minimising my chances of losing. As things turned out, I clearly made the right choice. In retrospect, though, I have more doubts as to whether it was, objectively speaking, the best choice. After all, I hadn't put any thought into how I'd swap the pieces off, I just kind of assumed that I'd be able to. 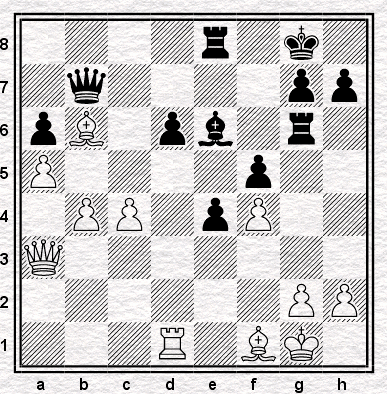 Looking at the game again, White was rather compliant around moves 27 to 32. Had he tried to keep some bits on, the game the end of the game could have been very different. Opinions as to what you would have done in the original position, and perhaps how White might have defended the ending better, are welcome in the comments box. They'll be too late to help me for Gatwick, but they could well help me at Benasque. Anyhoo, it's time I caught that train. See you Monday. There's a drama-documentary on Radio Four today: The Chess Girls. It's on at 2.15 this afternoon, and presumably available subsequently on iPlayer. So I’m back. Not from out of space, as per the Gloria Gaynor song, but from deepest Dorset, although as far as being able to connect to the internet was concerned, the effect would have been pretty similar. Things are pretty different here in London. Looking out of the window I no longer see cows grazing on the far side of the valley, nor, off to one side, do I glimpse the sea knowing it to be just a ten minute walk through fields and country lanes away. I’m guessing most of you, our valued readers, have never actually been to Streatham, so you'll have to trust me when I tell you that is not, in fact, what I'd see if I were to look out of the window right now. The view is not the only thing that changed for me. 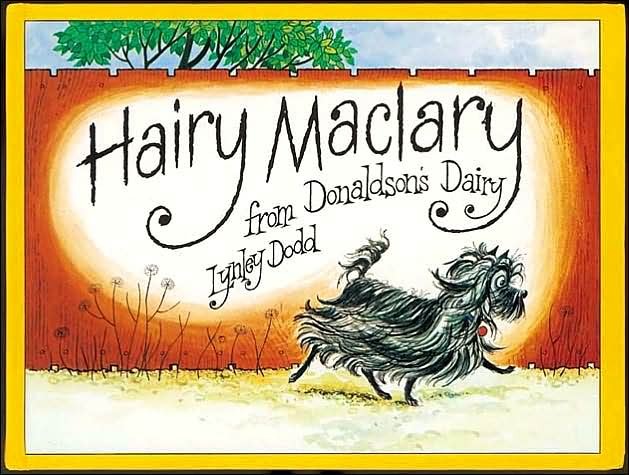 After spending most of the week either building sand castles or reading stories to Freya and Thanial, my sister’s children – after what must have been at least a thousand repetitions, I have become intimately acquainted with Hairy Maclary from Donaldson’s Dairy - I suddenly found myself at rather a loose end. I could have filled the time by watching Nick Pert’s Killer Endgames DVDs, I suppose - last week I spent many of the hours after F & T's bedtime doing exactly that - but for my first night home I decided to take a night off from endgame study and watch Harry Brown on DVD instead. An evening of urban dystopia seemed quite appropriate given the change in my surroundings. The film, I have to say, was pretty much as expected. Imagine Death Wish transported a few thousand miles east and 35 years into the future, replace Charles Bronson with My Name’s Michael Caine and you’ve got 95% of the film in your head right there. Not that it’s terrible by any means. It's just that you’ve probably kind-of sort-of seen it before and it's not a little predictable as a result, that’s all. The DVD extras are fun, though, and not just because you get to see the actors and director get asked “what attracted you to this project” and then try to come up with an answer that isn’t “I thought copying an already successful film would give me a decent paycheck”. Buried in the Extended & Delected Scenes section, you see, is an extra bit of dialogue that got cut out of the Frampton-Brown chess scene. I couldn't play a machine. Len always said 'you play the man not the board'. He also had this theory that everybody had a personal identification with a particular chess piece. It represented who you are, whether you knew it or not. I mean, like some people are pawns. One move at a time, one space at a time. Simple. Easy. One-dimensional. Others are rooks. Straight ahead. Forward. Backward. Life in a straight line. Come at you direct. And then there are others who are crazy knights. Jumping over people. A little step to the side. Unpredictable. And they're all there to protect the king who's one of the most powerless pieces on the board. He has no more movement than a pawn. You see the real power is with the queen. She can go anywhere. You forgot the bishop. He cuts across the board. Comes at you sideways. Blindsides you. You didn't come here to talk about chess. Well, you can see why they took it out, can’t you? Just a tad trite, methinks. Mind you, sometime it's best to leave things behind even if you quite like them. Take where we stayed in Dorset, for example. It was lovely and all that, but, aside from the absence of internet, it would probably have taken at least an hour's drive to get to the nearest chess club. In the first post we saw that the artist had painted a two-mover into his picture. It's not too late to have a go at solving it. The answer is further down if you need it. However, success won’t get you any bonus points as, frankly, most decent ten year-old chessers could get it, as we'll show below. So, who first figured out the position that was indistinctly represented in Dadd's murky painting? It appeared in the Chess Addict editions, but Richard James says that it was the late Mike Fox who wrote the section on chess-playing artists, and so for obvious and sad reasons that trail goes cold. Eduardo Sadier’s mega database of two-movers has the problem, but Sñr Sadier says he doesn't know from where it was sourced, and moreover there are no variations of its setting in his files. It’s a one-off. So that’s another cul-de-sac. “The title [of the picture] refers quite literally to the position on the chess board, which represents a very simple composed problem…simple enough, in fact, to be solved or even set by a child”. Well, is it "simple enough to be solved by a child"? 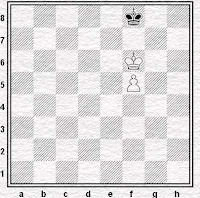 Richard James tried it out on a group of his young chess students (thanks Gerard, Max, Marley, Anais and Nick), and the answer is "yes", though whether a ten-year-old Victorian child (guessing at the age of the Child), without Richard’s coaching skills, could have managed it is another question. And another thirty-plus years later, opinion remains the same (thanks to Michael McDowell, Vice-President of the British Chess Problem Society, for taking the time to give us his contemporary assessment). 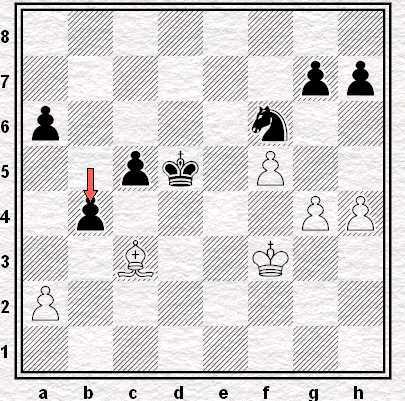 Serious problemistas, such as all the aforementioned, like to savour more than one line of play after the key move. But, while nul point is their verdict, an over-the-board player (well this one, anyway) might be rather pleased to see the black king obliged to self-destruct. We could even go a bit psychological and see it as a metaphor for Dadd’s own predicament. 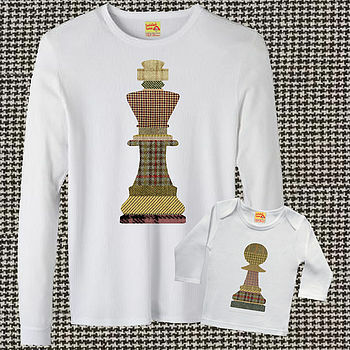 So, could Dadd play chess well enough to compose a Problem as rudimentary as this? Ms. Allderdice, who was the archivist of the hospital says “chess was a popular pastime in Bethlem". Although she adds “but there is no evidence as to whether Dadd played or not”. Mike Fox suggested otherwise in the Addict. 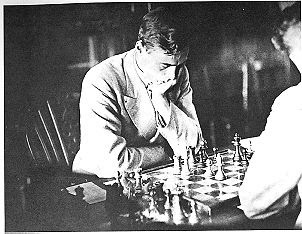 He said “In his journals [Dadd] raved about the Ruy Lopez”, which makes Dadd sound like a real devotee of the game, “raving” (as Mike indelicately put it) knowledgably about a favourite and sophisticated opening. 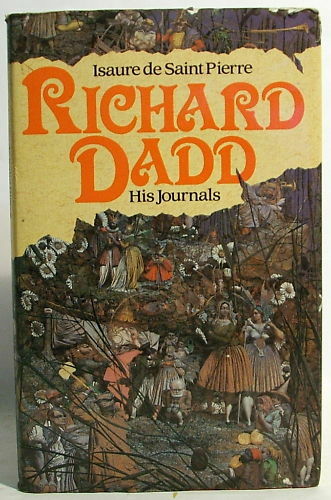 It is unlikely though, Richard thinks, that Mike researched the primary sources, and it seems therefore that he got the reference from Isaure de Saint Pierre’s portrayal of Dadd’s life published in 1984: Richard Dadd - His Journals. Really? Would Dadd have used algebraic notation? Would he have spoken of the Lopez Bishop commanding the centre from b5? And those moves. The precise order may have been misremembered, of course, but an early ..a6 in the Spanish in the mid-19th century, in Bedlam? Black castling without moving his f8 bishop? 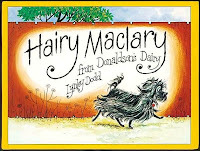 Authorial licence? More than likely. It seems probable, then, that the author consulted, adapted, and maybe inadvertently mangled, a late 20th century chess source for the words she puts into Dadd's mouth. To spare my further blushes I won't mention the other things she puts there in the course of the novel. There is, however, something rather more reliable on Dadd's chess interests: a note made by Dr. William Orange, the second Medical Superintendent of Broadmoor, on November 7th 1864 when Dadd was there as a patient. Dadd, incidentally, painted his portrait, suggesting mutual trust and confidence. If you strip out Dadd's idiosyncratic theory concerning the selective animus of the pieces he seems to be saying that (a) some people can't play, (b) others are so good they can do so without seeing the board or, as we would say, they can play "blindfold". So here is an intriguing thought: could the reclining figure in the picture painted seven years earlier be doing just that: playing blindfold? "After your last move, I now announce mate in two, beginning 1.Qd8!" From the chess point of view could this explain the relative placing of the two characters in The Child’s Problem? Although there may be a contrived two-mover on the board, Dadd may have indeed intended that the figures should be seen as playing a genuine contest. 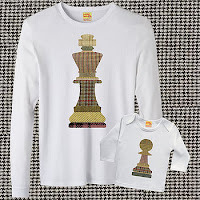 One player, the child, has sight of the board, but his opponent is playing alongside with eyes tight shut: or as Dadd phrased it, "playing Chess without the board". And with that, please come back for a further post in a few weeks time on the Dadd story, when we will look at more chess in the Asylum. And in the meantime check us out on the Bethlem Royal Hospital Archive and Museum Blog (see their post of 6 June). References etcIsaure de Saint Pierre (ed. Anthea Bell), Richard Dadd - his journals. Aiden Ellis, Henley 1984 (originally published in Paris 1980). Thanks to Colin Gale and Victoria Northwood of the Bethlem Royal Hospital Archive and Museum for their generous assistance, and to Richard James for his help in general, and for the solving exercise and the Miss Baird tip, in particular. For the story of another involuntary, but brief, visitor to Bethlem see the last episode of Every Picture Tells A Story. 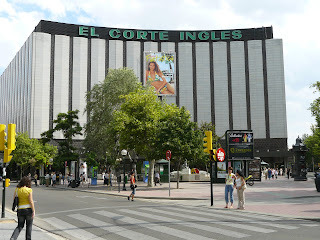 I am giving a simul on Saturday, at El Corte Inglés in Zaragoza. I've never really given a simul before. I've stepped in to help, on one occasion, to give the proper players a rest, but I've never actually been invited to give one before now. 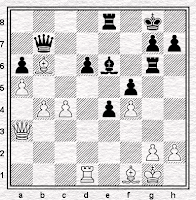 45 - as it happens, just a few days shy of 46 - must be unusually late in life for giving one's first simul. Presumably because most simuls are given by people who are good at chess and these people usually develop their talent at a rather earlier age. About three or four decades earlier. 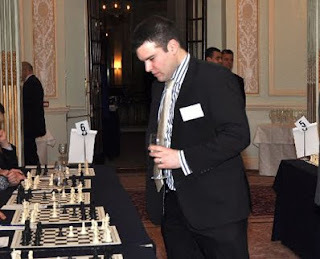 Fortunately, saying "I am giving a simul" rather exaggerates the extent of my involvement, since I am only one of a team of players, some of whom can actually play the game. It's an annual event called Ajedrez En La Calle (Chess In The Street, as the simul takes place out of doors) organised by the Aragonese Chess Federation. I'm invited to take part as the reigning champion of Huesca, one of the three provinces of Aragón. Might be fun. Or might be an absolute disaster in which case I will presumably be forced to flee the city by boat. I've been on the other side of a few simuls, of course, not that I have any scalps to tell you about. I did once win a prize at a simultaneous organised at the 1983 Candidates' Semi-Finals in London. 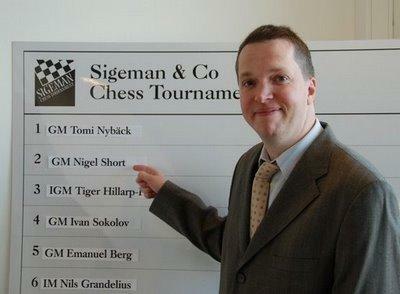 There was no play in either match that day (in those days players could and did take time-outs) and so would-be spectators were invited to take part in a simul given by the estimable Jon Speelman, an offer I accepted. and had I played, the computer says, 30...d5! rather than the asking-for-trouble 30...Qc6 I selected, then in theory at least I'd have been favourite, though in practice it would have been very easy to go wrong, playing a grandmaster. But, as it turned out, I didn't win. I didn't even draw. I nevertheless received the aforementioned prize ... for being the last player to finish. 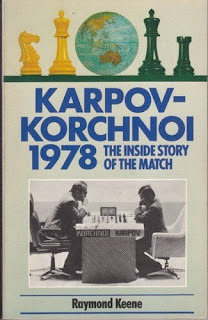 This prize was, you'll be impressed to learn, a copy of Ray Keene's notorious book on the 1978 World Championship match. A book that I already possessed. As it happens, I played Ray himself in a simultaneous eleven months later, at Blackwell's bookshop in Broad Steet in Oxford, in which city I was then a student. I remember, after the game, telling the Oxford Mail reporter that I'd had a better position but I had to go home to finish an essay. Which may even have been true, but that doesn't make it much less embarrassing a thing to have said. 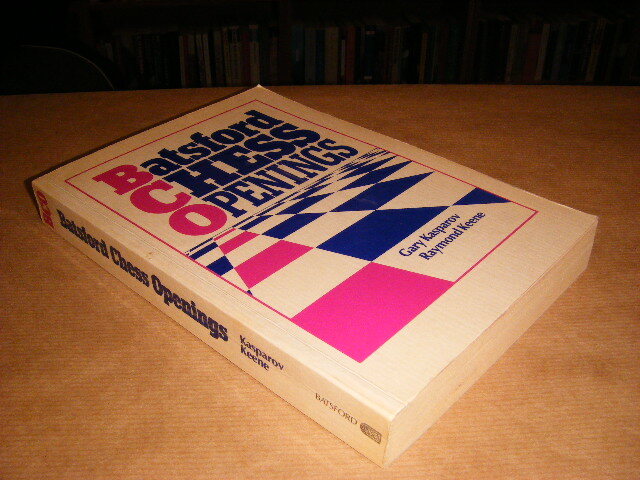 The prize, this time, was the perhaps equally notorious first edition of Batsford Chess Openings, which Ray was touring to promote. 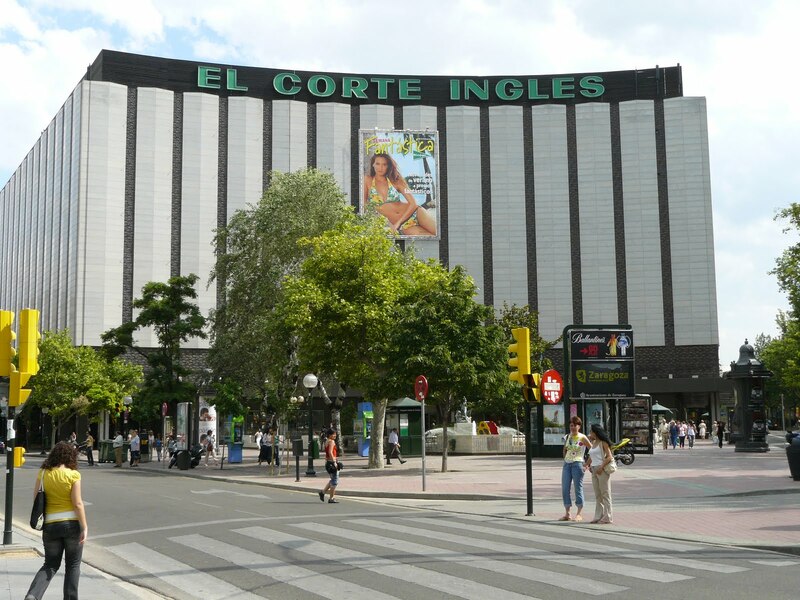 Anyhow, I can't imagine that, in twenty-seven or twenty-eight years' time, anybody will be remembering a simul in Zaragoza in June 2011. Or reproducing the score of a game they played against me.